It was recommended that we begin a new thread for ships of the Colonial Marines to catalogue canon, expanded universe and fan created ships. When adding to this list, please supply the origin on the ship from canon source or fan. USS Lucitania () - fan made, Major Gunn? Last edited by Yellowjacket on Thu Aug 30, 2018 5:25 pm, edited 67 times in total. Last edited by SGM Baldwin on Thu Apr 30, 2015 11:01 pm, edited 1 time in total. USS Eastland, APA-163. Haskell-class attack transport. 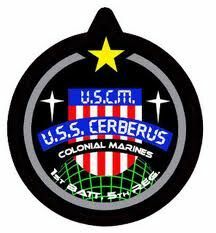 Awarded fleet battle star in 2174 for destroying three enemy ships while landing Marines in the Kerama system. Enemy propaganda broadcast the following day called out "And a special good morning to the crew of the USS Eastland, that destroyer disguised as a transport. We have a special surprise for you." Thank you. IF anyone should see other changes that need to be made to the list, just let me know and I'll update them. I'll be making subtle changes to the list and corrections as I have time. I'd love to see more ship patches added to this thread (as Dom did). It is inspiring to see what people have created. Would it please be possible to add a ship to the registry? USS Lingard (3rd Battalion, 5th Regiment). The Lingard is a Conestoga-class vessel under the command of Major Tina Hunt. It is a fan made vessel from Aliens: Origin. I am hoping to please submit our fan created ship (DBalschi and I) to the registry. We are the 2nd Battalion, 4th Regiment. Our ship is called the U.S.S. Erebus (sister ship of the U.S.S. Terror). More information and background to follow. 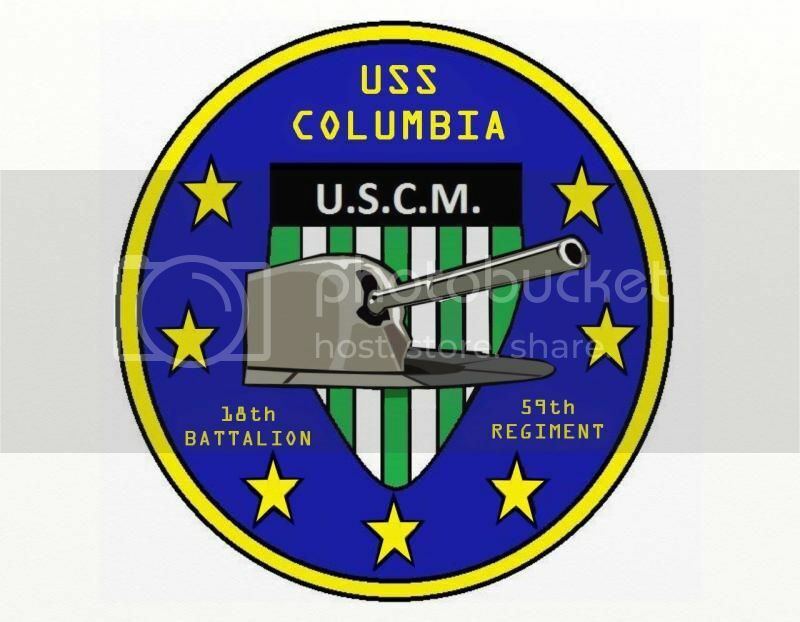 Actually I had updated my ship patch quite some time ago, it is no longer 3rd Batt. 1st Regt. It is my birthdate, 10th Batt. 22nd Regt. It's more closer to the original U.S.S. Sulaco style, which I prefer. Last edited by Moosh89 on Fri May 01, 2015 3:36 am, edited 1 time in total. 1. )The bear is from our state flag which was modeled after the last grizzly bear captured in Ventura county, and kept in captivity til it died in 1911. It's name was Monarch, hence the call name "MONARCHS". 3. )The battalion number "9" is in tribute to the date September 9th 1850, when California was granted statehood. 4. )The regimental number "31" is in tribute to the number of our state as in order of granted statehood. Last edited by WILLIAM D. RIDDER on Thu May 07, 2015 10:02 pm, edited 7 times in total. The 10-point star is a little off, Melissa. If you'd like email it to me I can fix it up a bit. Can I please have the U.S.S. Fremont ship patch added to this list? I already contacted, and have received official recognition and support of it via the most senior ranking member in the state of California, Hollis DZC (Rex Adams) who, by the way, asked me to send him one. That's more support than others have needed in order to get theirs accepted BTW. Here's an image of the hard copies I had produced for the group. Most, if not, all of our members already have their uniforms and gear, and my own is coming along. I'll be sewing the appropriate screen printed patches onto the BDU's upon receiving them in the mail. Here's the official patch art that can be used on the ship patch list. Last edited by WILLIAM D. RIDDER on Fri Aug 07, 2015 10:42 pm, edited 1 time in total. Can I please add HMNZS Te Kaha (1st Batt, 1st Regt) to the list? It is a fan made NZCM ship. The design is derived from an alternate Sulaco patch. I thought there was a ship designation in Washington State, the USS Duwamish, or something like that.... am I mistaken? "... you call, I'll haul!" What would be helpful is if i could get some idea of how many are in each ship? The USS LEGACY patch reads 1st Battalion 1st Regiment. Mantroon: is there something in the works we should know about? 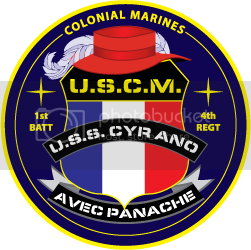 The reference above to seeking approval for a ship's patch surprised me as this hasn't been a requirement before. For the record the USS Conrad has a crew of one. Anyone in the world is welcome to join (provided they can handle modifying a Sulaco patch by hand) so it was never concieved of as a regional ship. If in the future this becomes a requirement that's okay, as I said I'm currently the only one assigned to it. The USS LEGACY patch reads 1st Battalion 1st Regiment. If somebody that has a patch could share a photo that would be great. With respects, Rex is not as much a standing member as much as he is more so an over all commander/ advisor of us, and any other groups from this regional area. An update is needed here. Rex Adams has accepted the position as the official OIC of the Monarchs. The USS Alamo patch originates from the AvP life action role playing game series. The series ran from 2005 to 2010 at the Donnerskopf in Germany and was quite a lot of fun. While there were't too many intricate props around the atmophere was simply great. Especially the later events were fantastic as the team got access to the 3 level atomic bunker from the cold war area. Combined with a few strobe lights, some fog and a few aliens or predators lurking in the shadows you got the perfect setting.